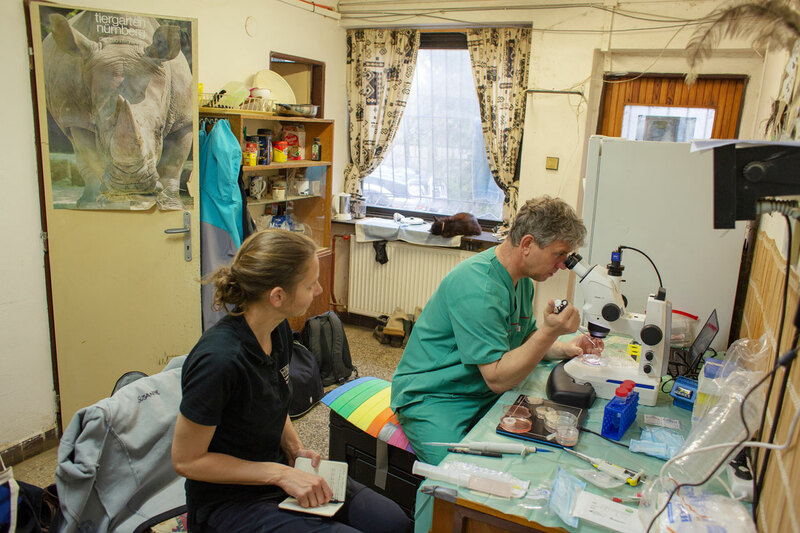 Rhino Project - IZW Leibniz Institute for Zoo and Wildlife Research in the Forschungsverbund Berlin e. V.
The extinction of Southern White Rhinos was prevented due to conservationists taking action – it is one of the big success stories of animal conservation. Today’s technology, particularly Artificial Reproductive Techniques (ART) and stem-cell research, gives us an opportunity to also save the Northern White Rhinos despite their so dramatically low numbers. In 2015 a plan on how to save the Northern White Rhino was developed including all the scientists, scientific institutes, and conservation partners involved. As a two pronged approach it aims to adapt Artificial Reproductive Techniques that are common in modern animal husbandry and amplify and add to them by stem-cell research developed over the recent decades. 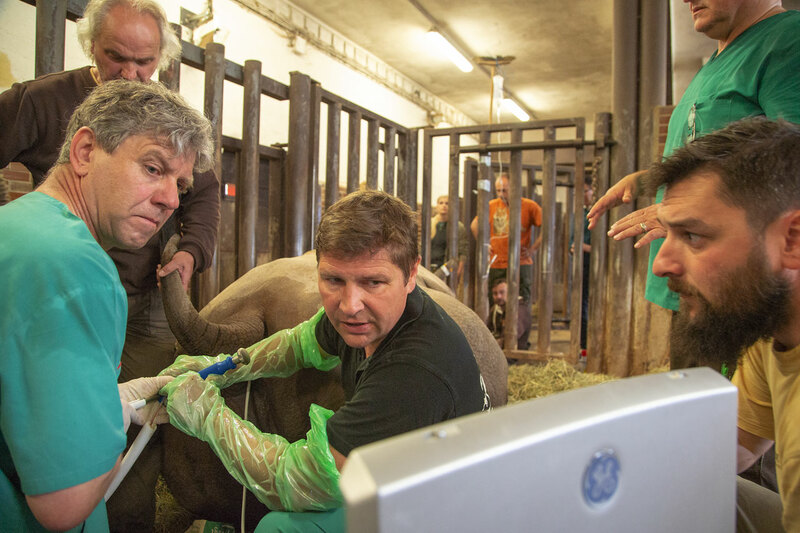 A team of scientists, conservationists and supporters, around Reproduction Management specialist Prof Dr Thomas Hildebrandt, Prof Cesare Galli and Dr Sebastian Diecke have been collecting Northern White Rhino sperm and egg cells whenever possible, often on their own initiative. The samples are stored in liquid nitrogen at minus 196°C and can survive and remain viable material for decades. Northern White Rhinos share a common ancestor with the domestic horses – which frequently undergo routine procedures involving in-vitro fertilisation and artificial reproduction techniques. Adapting even a well-established technique to an entirely different species is a difficult task however, and required the development of new approaches. Rhinoceros are far larger then horses and difficult to manage animals. No one had – so far – ever managed to successfully employ ART with Rhinos. As the ovaries of Rhinoceros cows are 1.5 meters inside the animal, and as the egg follicle is very small in diameter, existing tools and procedures cannot be used. As the animals need to be under anaesthesia during the procedure it cannot be repeated often and only with healthy enough individuals. 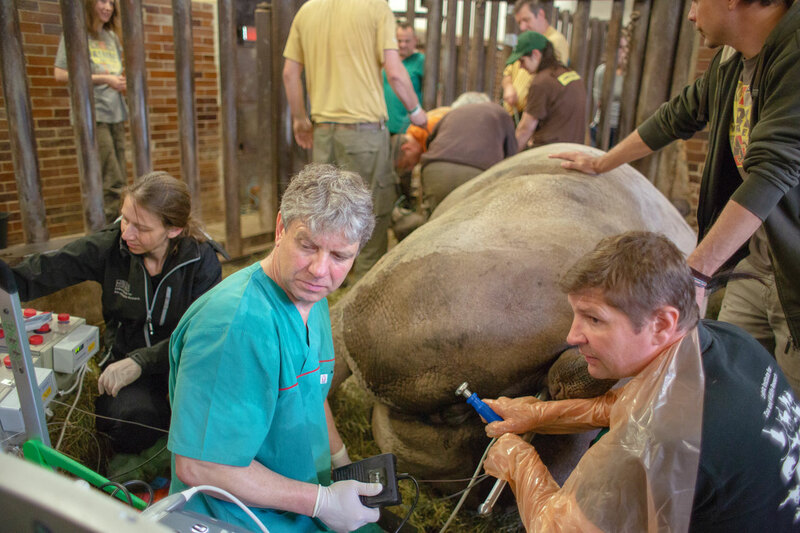 Northern White Rhino embryos created through ART could be implanted into Southern White Rhino cows who would act as surrogate mothers to a fledging Northern White Rhino population. On the other hand, ART alone would not be enough to establish a genetically diverse enough population that can remain stable as the remaining sperm and egg cell samples are from too few individuals. 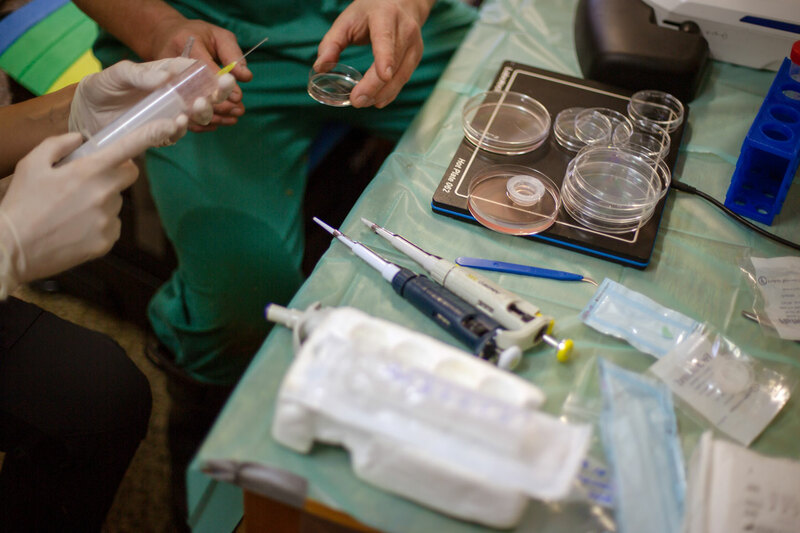 By manipulating existing cells it is possible to produce pluripotent stem cells – cells that self-replicate and can turn in any cell of an organism – from other Northern White Rhino tissue samples. The technique makes it possible to generate embryonic cells that can develop into living organisms through artificial fertilization. By utilising stem-cells the genetic material available for in-vitro fertilization and generating NWR embryos would expand massively compared to the limited number of spermatozoa and egg cells available. In combination the two approaches could bridge the genetic variability gap that makes artificial reproductive techniques on their own impossible. Now in 2018 much of the first part of the plan is in advanced stages: Over the last decade Hildebrandt and his team have developed a now patented device that can collect Oozytes from Northern White Rhinos and other large mammals. The ultrasound guided device is placed transrectally and once a follicle shows up on the screen of the ultrasound-laptop a special needle can be activated to puncture the intestinal wall towards the ovary and the follicle to harvest the oocyte. 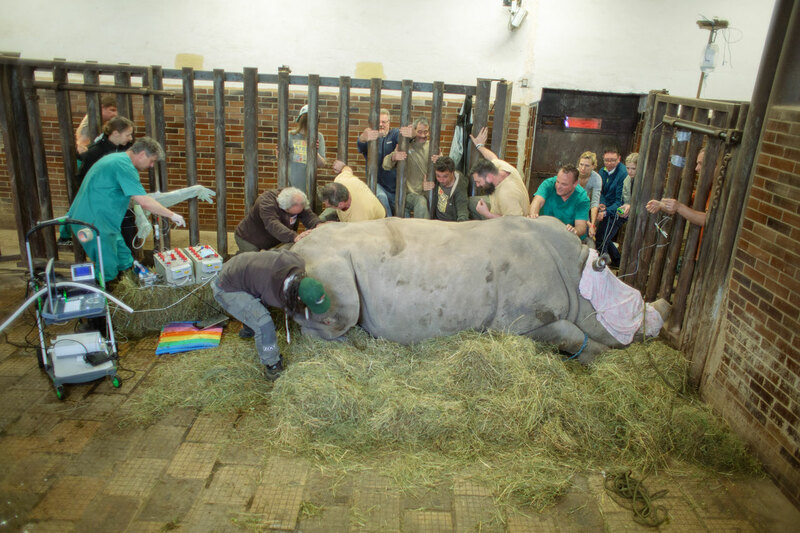 The scientists have by now performed over 20 oocyte collections in Southern White Rhinos across Europe. The first known in vitro development of hybrid-embryos of Northern and Southern White Rhinos is a massive breakthrough as it already secures half of the genetic information of a Northern White Rhino. The embryos are now cryopreserved for a future transfer into surrogate mothers.